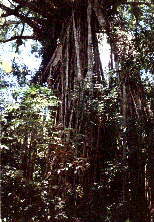 The Cathedral Fig Tree is located about 5 km from the Gillies Highway. It is the same species of tree as the Curtain Fig Tree (Ficus virens), but through different growing pressure has evolved to display a different habit of the commonly called strangler fig. Many species of animal can be seen seeking shelter in and around the Cathedral Fig Tree including: Papuan Frog Mouth, Rose-crowned Fruit Dove, Emerald Fruit Dove, Pale-yellow and Grey-headed Robin, Orange-footed Scrubfowl, many species of reptile, Possums and Tree Kangaroo.